Life in space is hard, lonely, and the only person you can rely on is yourself. Whether you’re living deep in the gravity well of humanity’s watery home, mucking out air vents in a city floating high in the clouds of Jupiter, or re-checking the filtration system on some isolated space station, life is hard and demanding, and life is small. 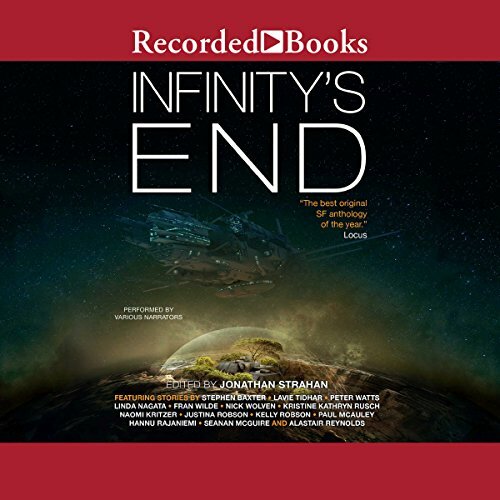 The stories of Infinity’s End are set in those empty spaces, in futures where planets have been disassembled and reused for parts, or terraformed and settled; where civilizations have risen and fallen; where far future people make their lives anywhere from colonies hanging in the clouds of Neptune or Venus to the repurposed cores of distant asteroids; on worldlets and asteroids, inside Saturn’s rings or distant spheres and wheels, on-board ships trucking from home to home, and port to port. They're set in a future that's lived in. And they make it clear that even if we never leave the solar system, there's life enough and room enough to live out all of science fiction's dreams. Infinity’s End is the future. The stories you’ll find here are the stories of your life. For myself, the most memorable of these stories were those focusing on hard science fiction elements of time and physics. Those Hannu Rajaniemi, Stephen Baxter, Seanan McGuire, and Peter Watts were especially compelling. And the readers often elevated the material.